Online Budget Calculator: The Good, the Bad and the Ugly – Budget Hub! A good online budget calculator can help you keep things in order. Even the greatest online budget calculator is no longer private; the best ones are often ones that are for public use. An online budget calculator has multiple uses; some of which include saving you money and assisting in debt reduction. Not using a budget calculator is a huge mistake. Often times a computer will make less calculation mistakes than a human calculating a budget will. The quality of the online calculator is something that someone should keep their eyes peeled for. If the calculator is not programmed correctly, it could make a monstrous mess of your perfect budget. Budgeting is most definitely one of the best ways to keep your finances on track; and an online budget calculator will help with budget creation. Using such tools will also enable you to properly prepare for your future economic endeavors. There is no reason for you to not start using one of these tools today. It could save you money and most importantly time. These three that we have listed below may just be the best option for you. Before we list out what calculators we’ve picked, it would be wise to tell of just where we’ve found them. These calculators below were found using several different sources. One of the ways that we utilized was being referred to the calculators via email. Awhile back on our social media accounts we asked our users to send in recommendations for their pick of the best calculator. Every recommendation was written down and taken into account when determining the final list of three. We also searched ourselves, reading through articles and adding the calculators to a master list. We have even received a few recommendations through word-of-mouth at conferences. The longevity of these tools were also important in our search for the top three and of all three of these calculators, we’ve heard of numerous success stories. Of the hundreds of online budget calculators, there were many differences. However, there were just a few universal specifications by which we sorted them by. The very first thing that we looked for in a particular application was the value and ‘bang for your buck’. It was very important that these calculators were free to use so that many people can utilize them. Another major key that we searched for was the usefulness of the calculators. What would be the point of listing them if they were not even a tad bit useful to our readers? Flexibility was the third factor that we used to determine the best of the best. The calculators need to be able to be used on multiple different devices, including computer and smartphone. It is also a bonus if these calculators are able to be edited to your needs with ease; such as adding additional financial fields. The final thing that we were looking for was the trustworthiness of the source. These calculators need to be secure do to the nature of the information that they’ll be processing. Schwab makes some of the best financial tools in the industry. If you are looking to do any type of financial calculation, it would be wise to use Schwab’s MoneyWise line of free online tools. The majority of the tools supplied by Schwab are free of charge; however some tools may require for you to have an account. This tool is great because it offers a wide expanse of fields to add information too. Some of these fields include: Income, education, health, and more. Another great addition to this tool that is rare to see on other calculators of this sort is Schwab’s addition of a percent of total box. One drawback to this great tool is the inability to add custom fields and expenses. There are just a set amount of fields to fill and that is all you get, no more, no less. The screen-cap above is of the Schwab Monthly Budget Calculator. This is undoubtedly one of the cleanest looking calculators in the field. With several different fields to put your finances into, calculations are accurate and a breeze. This tool by Bankrate can be found on the savings calculator area of the Bankrate website. This particular tool that they offer is free of charge. There are several things that are great about this tool; although it is not the absolute best. One major advantage of this tool is the longevity of it. In 5 years if you find yourself needing a tool of this nature, you’re sure to find that the Bankrate calculator is still up and operating. However, this is also a drawback. The tool is quickly becoming outdated. The calculator itself is created in basic HTML and is not keeping up with the standards. 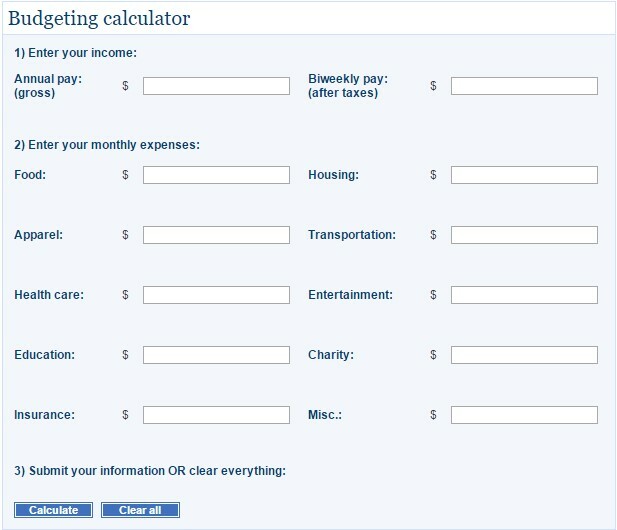 A bit outdated, the Bankrate budgeting calculator is still known to get the job done. This is a key tool in anyone’s frugal lifestyle. 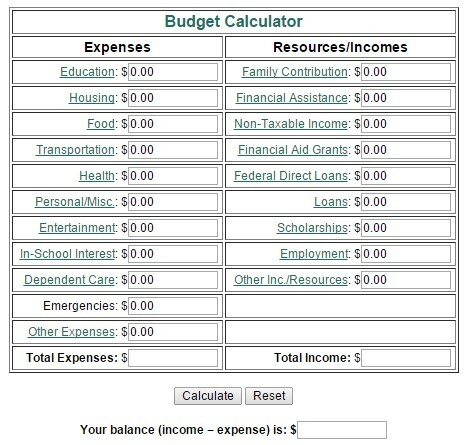 Finally, the online budget calculator provided by the United States government. This calculator is in dire need of an updated interface, but the power of it is still there. With all of this information spewed out onto the table, where does this leave you? You will need to determine which one you should pick. You could even potentially use multiple online budgeting calculators, but we would not advise you to do that because it opens you up for human error. You should pick the calculator that fits the needs in your life. Remember that the negatives of the three calculators listed above may just be an advantage to you; it all depends on how you look at it.